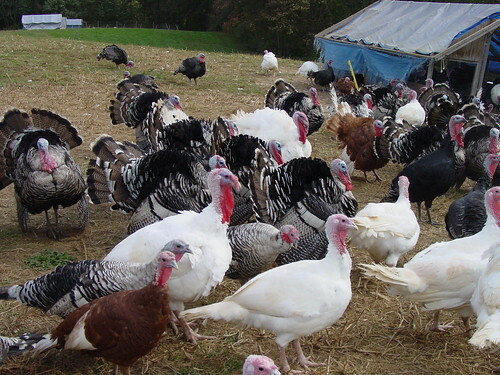 Jill at La Vida Locavore reminds us that the turkey most of us will be tucking into come Thursday is in fact an unwieldy freak of animal husbandry. While industrial farming's misbegotten offspring, the Broad Breasted White, is broad-breasted and white (and abundant), that's about all you can say for it. The alternative? Heritage turkeys. Unfortunately, they're pretty hard to find. A search of the Eat Well Guide - which is a fantastic resource for finding locally-produced food anywhere in the country and if you haven't yet checked it out, do so right now - suggests that I'd need to go at least 30 miles to get a heritage bird. Not that it isn't tempting: you just need to ogle the breasts on the birds above to realize that a heritage turkey is no puny grouse. They look like a turkey should. Meanwhile, if you can't find a Narragansett or a Bourbon Red or a Beltsville Small White, then at least get a sustainably-raised bird - those aren't nearly so hard to find. Come on, folks, you're not buying a Butterball this year, are you...? Photo by ExperienceLA used under a CC license.